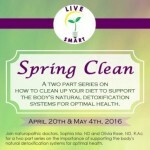 This is a two part series on the importance of supporting the body’s natural detoxification systems for optimal health. Your $25 registration fee includes both seminars. Please select April 20, 2016 when prompted to select a date. -What should you eliminate from your diet and for how long? -Which supplements and adjunctive therapies are helpful for your cleansing program? 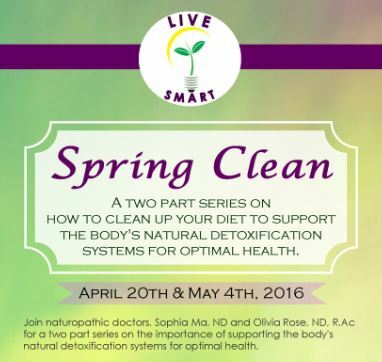 -How do you plan meals for your cleanse program? -How should you reintroduce the foods you have eliminated? -What signs and symptoms should you look for once you reintroduce the foods you eliminated? -How do you move forward while maintaining a healthy, but balanced eating plan?